BOCA RATON, FL (October 21, 2010)—More than 50 OPAL Awards committee members, Rotary Club of Boca Raton Board Members, Sponsors, past OPAL honorees and 2011 OPAL honorees attended a “Meet and Greet” reception at Spanish River Library. 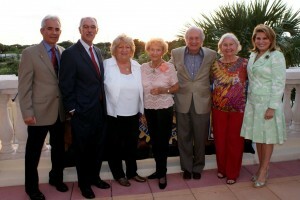 The event was hosted by 2011 OPAL co-chairs Ingrid Fulmer and Neil Saffer and the OPAL Committee. The OPAL honorees for 2011 will be Dr. David Robbe (Education), Jerry Fedele (Healthcare), Emily Lilly (Civil Service), Arlene & Jim Sclafani (Private Sector), Marta Batmasian (Community Service), and a new category Lifetime Achievement Award; Flossy Keesley as Outstanding People And Leaders in our community. “This pre-gala event has become a tradition for our OPAL committee where we have the opportunity to introduce the honorees to the committee, sponsors and board and take photos to promote the event”, noted Neil Saffer. The evening included an overview presentation by Rotary President, Alan Kaye, introductions of the honorees by Neil Saffer and examples by Ingrid Fulmer of how Rotary provides mentorship and scholarships for specific students in our community. All the food for the evening was donated by Jamie Gulden and her restaurant Set The Table. The wine was donated by Neil and Trisha Saffer. The Rotary Club of Boca Raton 14th Annual OPAL (Outstanding People And Leaders) Awards Gala on Saturday, January 22, 2010 will take place at Boca Pointe Country Club. A red carpet “Hollywood Style Awards Show” will be the theme for the annual fundraiser with proceeds allocated for scholarships that will be awarded to local college bound students in need. prize of a fantastic two -night stay for two, including breakfast and spa services at the all new Boca Beach Club donated by the Boca Raton Resort & Club. A maximum of 365 tickets are to be sold. Funds raised will go to the Boca Raton Rotary Fund for OPAL scholarships. Those who purchase two tickets at a time will also receive a $25 Gift Card graciously donated by Morton’s The Steakhouse located at Boca Center. Kaye Group/Commercial Real Estate, Flossy Keesley, Rosemary & Ben Krieger, Boca Color Graphics, Boca Raton Resort & Club, Boca Raton Magazine, Matrix Home Care, LLC., Miami Systems, General Contractors, Inc., Morton’s The Steakhouse, Multi-Image Group, Mummaw Associates, Inc., Richman Advisors, Tiffany & Company, Yaakov Heller, Uncle Tai’s, Zimmer Construction, Inc.
Providing college scholarships to worthy candidates has been the primary focus of the Rotary Club of Boca Raton who have been changing lives and building futures for more than twenty years. In 2010, the club awarded four-year college scholarships (including a laptop computer stipend) to eight deserving local high school students. These scholarships assist worthy young men and women in our community in the pursuit of their dreams. Proceeds from the OPAL Gala will again provide scholarships and laptops for deserving Boca Raton area students. For more information about sponsorship and tickets, contact Deborah Freudenberg at 561-245-2541.